Did you whisper the title? Okay, now close your eyes... shhhhhhh, that person you see walking off in the distance... who is that? Is the light following him? ohhhhhh, shhhhhh.... softly now. yes, it is Jimmer Fredette. Quiet. shhhhhhh. NOW WAKE UP! oh, wait you only had your eyes closed. Didn't even do that did you, you had to read my words for the Jimmer seance. Who is Jimmer? Please. The best college basketball player in the nation right now. Or so the jimmermaniacs would have you believe. And who are those folks? Mormons. LDS. and it is getting weird. It's not just BYU students, though. 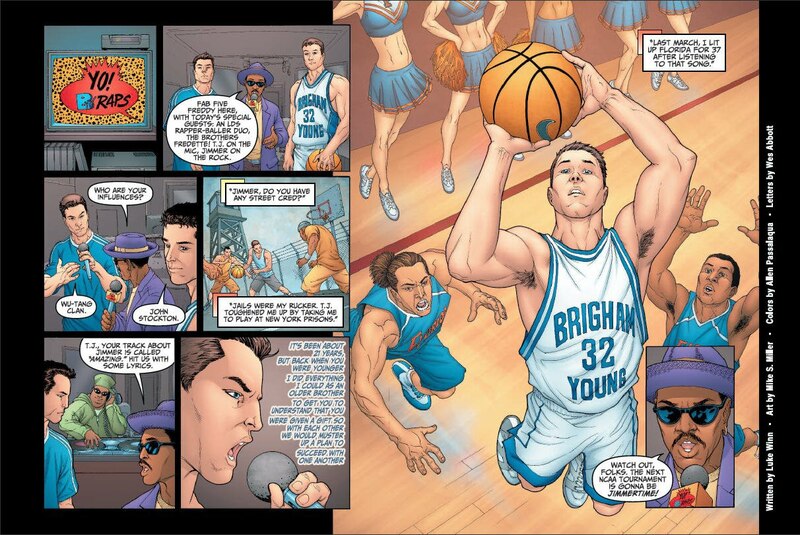 Jimmer has already been called a folk hero by Deadspin, which to some is on the opposite side of the spectrum. So, it's not just LDS. Why has it gotten weird? A lady named Michelle Peralta wrote a letter in the Daily Herald that spoke out against The Jimmer titled "Idol worship". The letter garnished quite a number of responses. When the comments section got stale Jimmermaniacs went over to her Facebook page and "Jimmered" it with over 1,000 responses in 30 minutes to a post she made there. There is now a website dedicated to this event called: michellegotjimmered.com. And poor Michelle's fb page? A meeting place for Jimmer fans. I find it fascinating to read through those comments. There is a struggle there that is hard to describe. Jimmer is from upstate NY which happens to be right around the same place Joseph Smith stomped around. Father is LDS, Mother is Catholic. Jimmer's sister was Miss Teen NY about ten years ago and his brother, TJ, is a DJ(?). How did Jimmer get so good? Read the stories one legend has it that older brother TJ took Jimmer to prisons to play ball against inmates. Another couple things that are making this whole thing weird: First up. 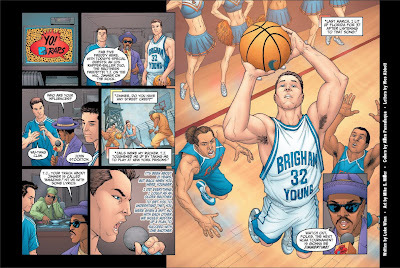 A few BYU former players (including Shawn Bradley) made a song tribute to him. 2nd up. Time magazine called him a Twitter Legend(?) not sure why he is a legend even after reading the article. Kevin Durant called him "the best shooter in the world!!". Note: if you read the article note the way it is written. It's like Jimmer is in the clouds somewhere only coming down a couple times a week to bury jumpers from "the parking lot, with guys in his face". Anyway, it's getting uncomfortable -and weird- Jimmer. ohhhh boy. get ready for Jimmer-Time this March. I gotta admit, he shoots from anywhere. Reminds me of Pete... but nobody is the Pistol.